Identifying information needed for the application: This included significant desk research to identify Geelong’s Indigenous, industrial and surf culture design heritage, recent design achievements such as Geelong After Dark, Mountain to Mouth and the award-winning Geelong Library and Heritage Centre, and the region’s future design projects, such as advanced manufacturing and virtual reality. Synthesising this into a cogent narrative: This information was then structured and synthesised into a compelling narrative, reinforcing the City’s recent strategic direction as a clever and creative city. This narrative was collaboratively and iteratively developed with an expert Project Control Group, with representatives from Deakin University, the City’s Enterprise Geelong and Arts and Culture departments, and with independent design practitioners, each providing their professional expertise, and providing a level of assurance in the validity and veracity of the information in the application. Development of supporting website: A fully responsive website was developed as an adjunct to the application, to showcase Geelong’s design credentials. This was developed in WordPress, using an off-the-shelf Theme heavily customised to align with the City’s Branding Guidelines. 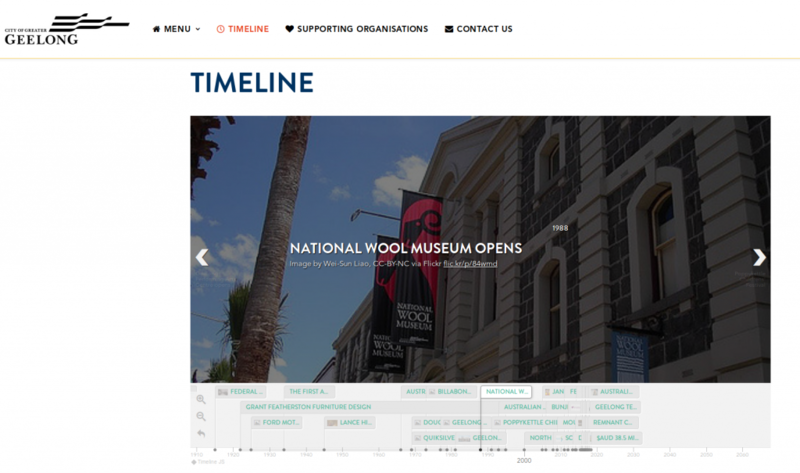 In addition, Timeline.js was used to create an interactive element, delivering an engaging, multi-device experience for people interested in exploring Geelong’s design journey. An Instagram plugin was also used to display a configurable Instagram feed. The website made extensive use of imagery to underscore the region’s design achievements. Google Analytics were deployed and configured to provide statistics on site visitors and visitor behaviour over time. The outcome of the application will be known toward the end of 2017. After winning a competitive quote process, I was engaged to consult on the City of Greater Geelong’s application to join the UNESCO Creative Cities Network (UCCN) in the field of design. Both the application and supporting website were delivered on a tight timeframe.